In January, 1860, Daniel Langdon and J.E. 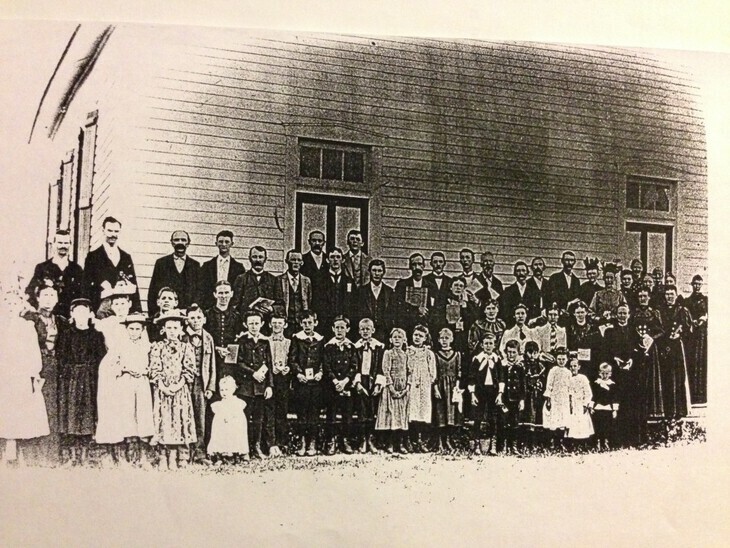 Caldwell held a revival at Providence Missionary Baptist Church and received thirty-four members into the church. In March, 1860 thirty-three of the members presented a written request to the church to be released to constitute a church at the Guyan Townhouse(which at that time stood on the hill near the Guyan Townhouse Johnson Cemetery). Five more, namely William Sheets, Elizabeth Sheets, George W. Sheets, Susan Sheets and Zachariah Sheets asked to be released as well. It was constituted a church on the 26th day of March, 1860, by James Henderson, A.J. Warren, and Issac Langdon. It was called Providence Bethel Church. The first church in Mercerville was built around 1835, was of logs, and stood in the cemetery at the edge of the village. It was of the United Brethren denomination and was known as Mercerville Chapel. Rev. J.E. Caldwell, a Baptist minister, came into the Mercerville community about the year 1848 and organized a Baptist Society which grew in numbers and in strength. Several years later in 1865, they took over the United Brethren Church. In 1874 they changed the location to the present site and built a frame church. The log church was built on Mercer Hill from which the village was named. Among the early members of these churches were Hugh C. Niday, Guy Fry, John Call, Eleanor Porter Niday, John Mooney, Stephen Caldwell, Jack Smith, Brice Smith, Jefferson Porter, Isaac Chapman, and John Wetherholt. The frame church was replaced by a tile block church in 1926-1927.